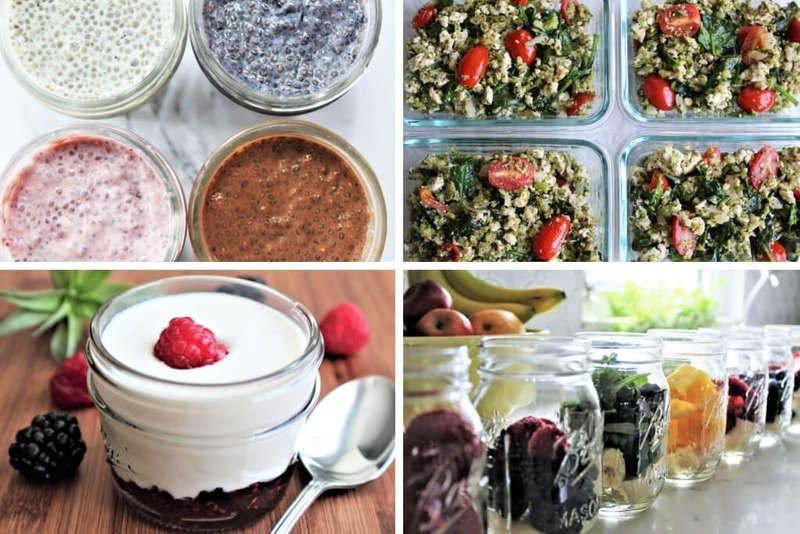 These vegan meal prep ideas will change the way you do breakfast and will completely save your sanity in the morning! Quick and easy vegan meals that you can make ahead and eat for days. Let me show you how my vegan/gluten-free family preps for those rushed mornings before work and school with ready to grab and go meals that are filling, high in protein, and most importantly, convenient! If you’re anything like me, you can barely handle making my coffee in the morning, let alone making a healthy meal for my family. I need to prep things ahead of time, or everyone is searching around complaining that there’s nothing to eat. Unfortunately, my family doesn’t like any convenient foods like cereal, and they need to be gluten-free, so toast, English muffins, and bagels are out too. So, I have no choice but to meal prep. I thought that you may find it helpful to see how I do my vegan meal prep! Veggie Packed Vegan Tofu Scramble with Pesto – Make a tofu scramble filled with your favorite veggies for a healthy low carb, high protein meal. Then pack it in glass Snapware containers so it’s ready to pop in the microwave in the morning for a hot breakfast! Easy Vegan Scrambled “Eggs”- These scrambled eggs will amaze you! If you miss eggs for breakfast, then this recipe is for you! You can make up a batch and keep it in the fridge until you are ready to fry it up or you can cook it all and put it into individual containers to reheat when you’re ready to eat. Mini Crustless Vegan Quiche – These delicious little muffin sized quiches are like a hand-held tofu scramble. They’re good cold or you can pop them in the microwave for about 30 seconds and have a portable, hot, high protein, vegan breakfast on the go! 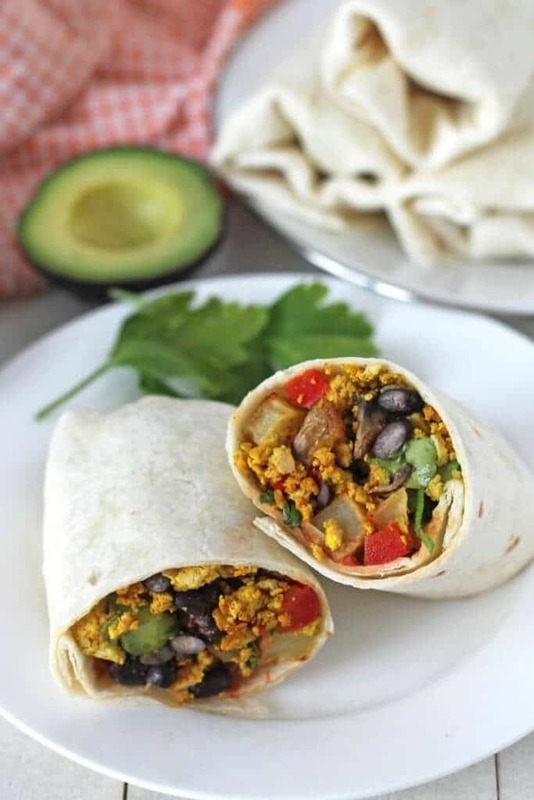 Freezer Friendly Tofu Burritos from Gwen at Delightful Adventures is also a great vegan meal prep solution! Make up a batch over the weekend and wrap them up and keep in your freezer until you are ready to heat and go! 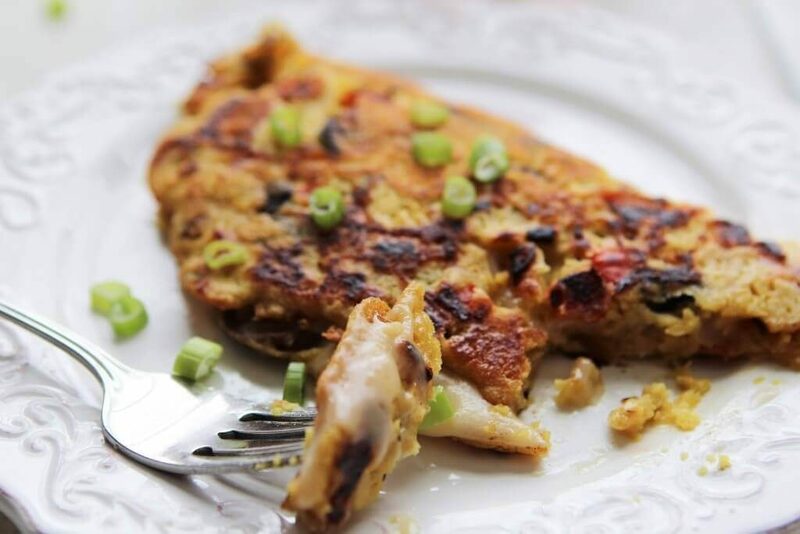 Chickpea Omeletts – If you haven’t used chickpea flour yet, now it the time! Chickpea flour omeletts are absolutely amazing! Full of protein, and you can pack them with your favorite veggies and they’re hot and satisfying! You can make up a batch of the powder ahead of time and just add water when you’re ready to cook them! They work great for camping and backpacking too! 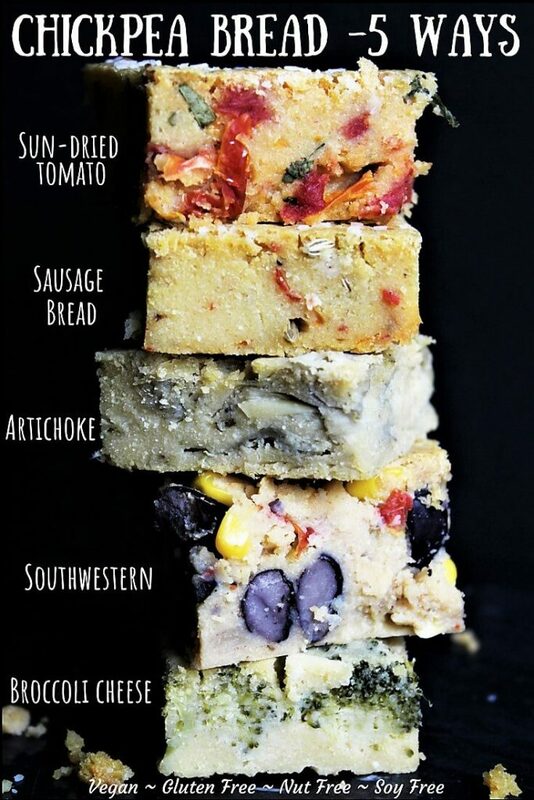 Chickpea Bread Made 5 Ways – This bread is another chickpea flour wonder! It’s packed with protein and you can add any herbs, spices or veggies that you like to make it in a variety of flavors. It’s kind of like a cross between quiche and cornbread. Slice it up and it’s ready to grab and go for days! Cookie Dough Bites – Yummy little treats that are like a bowl of flax oatmeal rolled up into a convenient little ball of cookie dough ready to pop in your mouth and go! Just dump the ingredients into your food processor, blend, and roll into balls. Healthy Almond Butter Freezer Fudge- You may not think of fudge as a breakfast food, but this is fudge is made from only almond butter, some maple syrup, and cocoa powder. You simply mix the ingredients into a batter and freeze it until firm. You then have bite-sized chocolate flavored almond butter bites. Healthy Vegan Muffins with Hidden Veggies – These muffins are packed with zucchini, carrots, flax, applesauce, and oats yet they taste as good as a cupcake! My kids eat muffin after muffin, not knowing how much nutrients are packed into each one. Any muffins work great for meal prep as long as your family doesn’t eat the whole batch as soon as it comes out of the oven! (This can be an issue in my house 🙂 ) Some of our favorites are vegan pumpkin muffins, orange cranberry muffins, and my gluten-free vegan banana bread made into muffins. 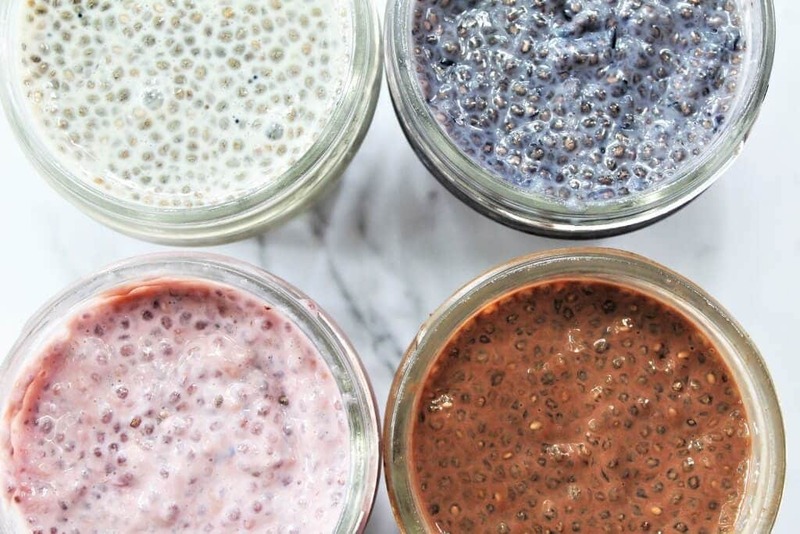 Easy Chia Pudding – The easiest way to make healthy chia seed pudding! Put it into little 4 oz. 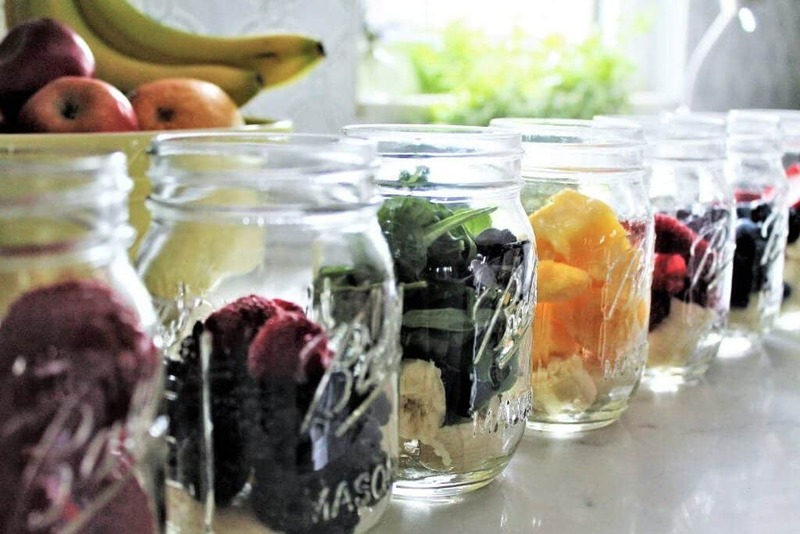 mason jars perfectly sized for kids to grab for breakfast or a healthy snack! I usually make up 12 at a time in a few different flavors like chocolate, vanilla, strawberry, and peanut butter. The kids love them, and they can even fit in your purse bag for a snack on the go. 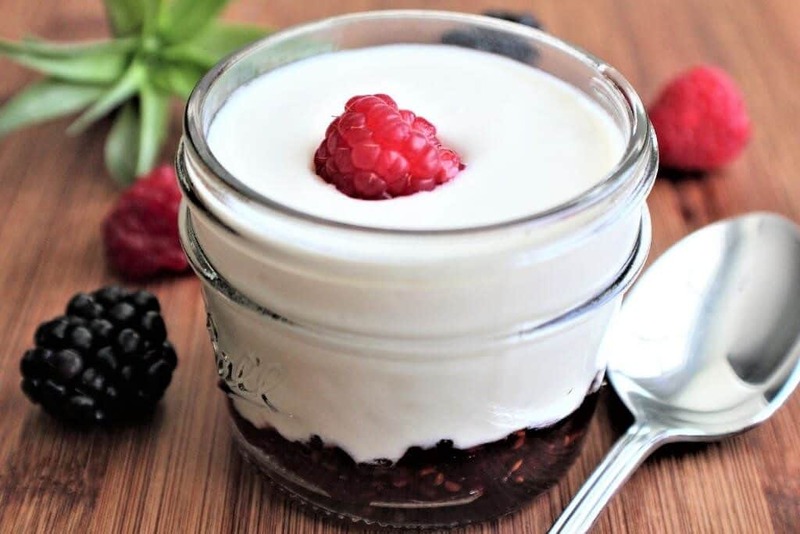 Soy Yogurt – You can buy many varieties or make your own vegan soy yogurt and top with berries. To have your yogurt prepped and ready to eat, put a little jam at the bottom of a 4 or 6 oz sized mason jar and fill the rest of the way with my homemade yogurt. This way you have ready to eat, flavored, portable, and perfectly sized fruit on the bottom vegan yogurt! Make Ahead Smoothies – These make-ahead smoothies have changed my life! I’m not being dramatic when I say this. My husband is gluten free, vegan, and hates most breakfast food. He searched the kitchen every morning in a panic that he had nothing to eat for breakfast. That is until I started to make up these smoothies and had them ready to go in the freezer. He just adds soy milk and blends right in the mason jar. He can then just put the lid back on and drink it on his way to work! The kids love them too! When they say that they want a snack, I can just direct them to the freezer to pick out a flavor smoothie. *Make sure to follow the safety instructions on your blender or get a blender designed to blend in Mason jars. Oatmeal – Instant oatmeal for a quick and easy hot cereal. Or you can use my oatmeal mug muffin recipe and have a fresh hot muffin in 2 minutes! Grits – These are delicious with a little vegan butter or some vegan cheese sprinkled in! Cereal – Just add some plant-based milk and you’re ready to eat. Hash browns – These are not the healthiest, but filling and convenient on those busy mornings. Toast – Top with vegan butter, jam, avocados, baked beans, or hummus. Bagels – Top with peanut butter, jam or vegan cream cheese. Fruit – Let’s face it, an apple or banana is the healthiest grab and go breakfast you can eat! I hope these make-ahead vegan breakfast prep ideas help you and your family to have some more breakfast and grab and go snack options! Leave a comment and let me know which ones you like the best or let us know if you have more ideas that work for you! I am a firm believer in planning EVERYTHING ahead of time! The recipes look amazing and are a dream come true for a planner like me. Pinning! Thanks! I hope that this helps you get ready for the week with healthy options for breakfasts and snacks! What a great idea! I’m going to try them all…breakfast is always rushed in our house and it could be great to have options. Thank you! 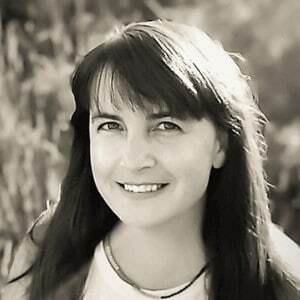 Great post for new Vegans! Meal prep is key right!